I wandered over to the dining hall on Saturday morning before Christmas. “Tita” Pat was busy packing baskets by placing herself in the last step of the process to make sure each basket had the right things and they looked “right” before the wrapping paper went on. 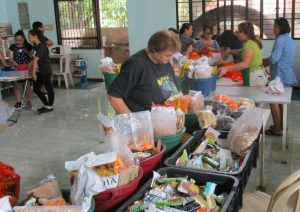 The next day 150 of those baskets went to pastors in Cabuyao. A couple days later I went skating with her boys — little ones she is raising. Faylene and I are sort-of grandparents. Those boys love their Mom. But, she does check on them…wants to know if homework was done, delivers consequences if they don’t listen. I’ve seen plenty over the last few years. She loves like a mother because she is one. Tonight she delivered homemade squash soup from her humble home. She was busy with company but wanted to make sure part of her “family” had some of her soup. A couple days before she cooked a meal for six; we were two of the six. She did not have to; she wanted to. She found out that my Bride loves chocolate. Faylene went with her on a shopping trip to get food for IFL folks. At the end of hunting for the items she needed, she cornered Faylene to give her a Snickers candy bar with a famous in-the-eye quote, “This is just for you. You don’t have to share it with Roland.” She tried to look serious. On her frig (they call it a “ref””) she has all the notes a school Mom would have for their children–from homework, to schedules, to responsibilities. One responsibility is to periodically get the boys to clean their room. Have you ever known two young boys that keep a room clean? It’s no different here, and she regularly has to remind them about what to do, and what not to do. When awards come around at the end of quarters, if an orphan has an award but has no one to walk up with them, then she meets them and walks up with them to get the award. She does a lot of that. She weeps on occasion when speaking of something the Lord has done. He has done a lot. The stories are pretty much without end. In her “spare” time she oversees IFL and a federation of Christian schools, participates in training or encourages pastors to minister in the jails or the hospitals. Her staff carries on with her. She goes to too many meetings, but must. The days are often long and arduous. She make no bones about it: Christ died for her. We like her aim — to serve Him, and love the “least” in the process. Her squash soup is scrumptious. Tagged Bible, children, inspiration, Philippines. « Know Him as Daddy? Copyright © 2014 by Christworks Ministries.